How wonderful it is to see the Snowdrops. They carry such a sense of hope in their tiny flowers. 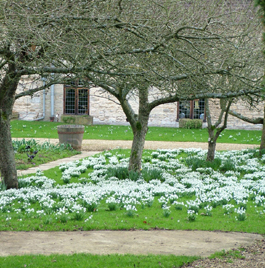 And in church yards, hedgerows and English gardens up and down the land, Snowdrops are blooming. They are such a delicate and fragile looking flower which signify the time of year beautifully. Winter is never keen to release its grip on the land and Snowdrops are one of the first signs that the grip is slightly loosening. We seem very keen (understandably) to take the sign of the first Snowdrops as the arrival of spring. That’s a little premature – and sometimes in our impatience we can miss the beauty around us now. The greatest joy of the ending of winter and the slow beginning, and gradual build up of spring, is the development of things over time. Nature like all good things does not rush or hurry. Each day there are small changes. Each significant in the bigger picture. Enjoy the here and now. 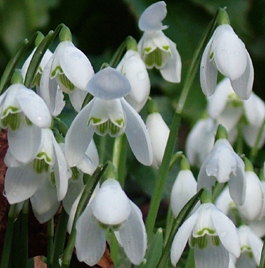 Savor the Snowdrops, look out for the first sights of shooting buds on plants and emerging buds on trees. Look out for the first bluebell shoots in the woodlands pushing up through the earth and be ready for the burst of activity from the birds. Celebrate and enjoy the arrival of the Snowdrop for what it is. Not a gesture of spring. But one of the last majestic and graceful gestures by winter.